This Chocoholic Chocolate Bundt Cake was dusted lightly over the top with powdered sugar, then glazed with the easy chocolate glaze recipe. Chocoholics love chocolate, which is where the name came from. But, as any chocoholic will tell you, not all chocolate is created equally, and the differences are really apparent when sampling chocolate cake. While boxed mixes have improved rapidly in the past fifty years, they still can’t duplicate the flavor and texture of a good from-scratch cake. This particular recipe has a lot going for it, and was actually “invented” when re-organizing my kitchen pantry and realized that I had some baking semi-sweet chocolate that needed to be used, as well as two open containers of Hershey’s Special Dark cocoa powder. The recipe is actually based on one from Martha Stewart in the 90s with some changes. First, there is the addition of shredded/ground chocolate, along with chocolate chips for additional chocolate for my chocoholic spouse. The second is swapping Bulgarian-style whole buttermilk for the milk. Lastly, I used regular all purpose flour and Hershey’s Special Dark cocoa instead of Martha’s recommended cake flour and gourmet cocoa powder. Like many others, my budget doesn’t exactly allow for mail ordering gourmet ingredients these days, and it certainly isn’t something carried in my small town grocery stores either. While the recipe is a bit “fussy” for many of us, the end result is more than worth the dirty bowls, mixer, and pan, even if it isn’t the everyday kind of cake baking we’d want to embark on. I swore that I’d dirtied every mixing bowl I owned by the time I was done and I know without a doubt that the sink was full of dishes waiting to be washed. Ultra moist, very chocolate-y, and perfect for a bundt pan, this is a very thick and rich cake batter. It can also be baked in layers for a luxurious layer cake. For casual serving for family and friends, the bundt pan is easy and no fuss. With just a thin chocolate glaze, it can satisfy the most serious chocoholic craving. Preheat oven to 350 degrees F. Use Baker’s Joy and coat 10 c. bundt pan evenly. Set pan aside. With whisk in small bowl, combine hot coffee with cocoa powder until smooth. Add buttermilk and vanilla and whisk again until well combined. Set aside. Beat butter in mixer until light and fluffy. Gradually add 2 c. sugar and continue beating until mixture is well combined and fluffy. In another bowl, sift together flour, baking soda, and salt. Add shredded chocolate and sugar mixture and stir to evenly combine dry ingredients. Add chocolate chips and set aside. Beat eggs, one at a time, into creamed sugar and butter mixture, beating until completely incorporated before adding next egg. Add coffee mixture and beat to evenly combine. With rubber spatula, fold in flour mixture slowly, stirring to evenly combine all ingredients. Make sure there are no unmixed pockets of flour! When ingredients are evenly combined, (don’t forget to scrape the bottom of the bowl!) spoon mixture into bundt pan. Mixture is VERY thick! Smooth top of batter, and place in preheated oven. Bake for 40-50 minutes, or until tester inserted in cake comes out clean. Cool cake 5 minutes on rack, then invert on serving platter and cool completely. 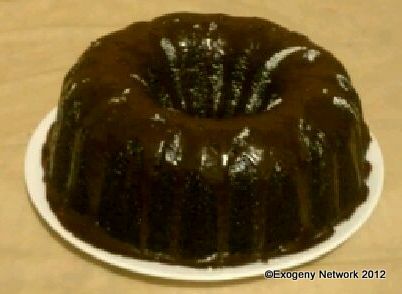 Drizzle chocolate glaze attractively over top of cake, letting it drip down the sides. Enjoy with a hot cup of coffee or a cold glass of milk! Sift powdered sugar and cocoa together. Add vanilla and whisk in milk, 1 tsp. at a time, until desired consistency is reached. Use immediately. This entry was posted in Cakes, Desserts, Easy, Potlucks & church suppers, Recipes and tagged bulgarian style buttermilk, cake, chocolate, dessert, martha stewart, recipes. Bookmark the permalink.